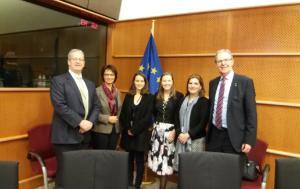 Welcome to the website of the European Parliament's Delegation for Relations with Australia and New Zealand (DANZ). The historic and cultural ties that connect the European Union to Australia and to New Zealand are strong. All three partners share a similar approach to a broad range of international challenges such as the fight against protectionism and against the death penalty. Ever since it was founded, in 1979, the DANZ delegation has maintained close relations with its parliamentary counterparts in Canberra and Wellington, and regular exchanges - called "inter-parliamentary meetings" - have taken place. In the most recent meetings, issues including the envisaged bilateral trade agreements, migration and the fight against terrorism have been a core part of discussions. The Delegation also organises regular meetings in Brussels and in Strasbourg. These serve not only to keep Members informed about developments in the bilateral relationship, but also to investigate whether and what the EU can learn from our partner countries, in, for example, areas like data protection and the protection of the environment. In an ever-more complex world, parliamentary exchanges and the work of standing delegations like DANZ can contribute to improving mutual understanding and to furthering the EU's foreign policy agenda. During this meeting the new Chair of the Delegation was elected. Ms Ulrike Müller, ALDE Member from Germany replaces Mr Michael Theurer. First Vice Chair Mr Axel Voss congratulates her together with Ambassador Taylor from the New Zealand Embassy and officials from the Australian Embassy. Members from the Australian Parliament led by Honourable. Tony Smith MP, Speaker for the Parliament held several meetings during the Plenary Session in Strasbourg 4-5 October 2017. The delegation met with the Secretary General and the Speaker also had a one on one meeting with President Tajani.